- Tile joint spacer is available in different sizes i.e. 2 mm, 3 mm, 4 mm, 5 mm, 8 mm & 10 mm. A superior range of Tile Grout Spacer is offered to our clients in various sizes, shapes and colors. Our range is of qualitative nature. Our collection is also customized as per the specification of the client. With extensive knowhow in this domain, we are indulged in providing a supreme quality gamut of Tile Spacer In Packing. Please find the host of tiles spacers available along wit rates as desired. 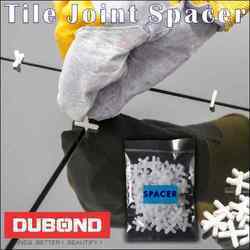 Tile spacer is used for giving a proper gape in tiles. • Made by: Made of Reliance or Gail petrochemicals High Density Polythylene. We are offering Tile Spacer Unicrete to our client. We can supply tile spacers used for laying of ceramic & vitrified tiles. 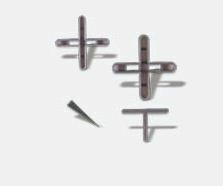 The spacers are available in 2, 3, 4, 5, 8 & 10 mm. These are made of virgin material with accurate dimensions and perfect finish. A superior range of tile spacer is offered to our clients in various sizes, shapes and colors. Our range adheres to varied quality standards. Our range creates uniform gaps that result in better linkage of the tile joints. Our collection can be also customized as per the exact specifications of our clients. These are suitable to be used in ceramic tiles.